David Harris is the Principal and owner of The Broadway Clinic. He graduated from The London Foot Hospital in 1983. Since then David has worked in both the NHS and in private practice. 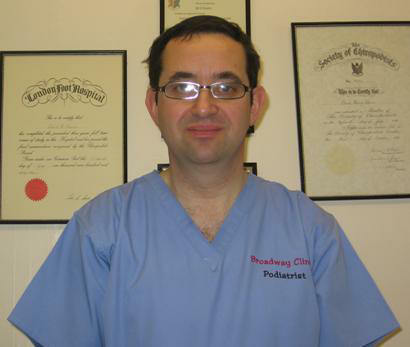 With over 25 years experience he is well qualified to treat all manor of foot related problems. His specialist field is that of Diabetic foot disease and he leads the Diabetic foot team at Edgware Community Hospital. Sara Razi is a Diabetic specialist, holding a masters degree in her speciality. She has a wealth of experience in treating all types of foot conditions. Amanda Brody graduated from the London foot hospital over 20 years ago and has practiced widely within the health service. Amanda has an interest in the diagnosis and resolution of all painful foot conditions. Our Reception Team - Sabrina and Helen are always available to help you with booking appointments and with any other queries you may have.